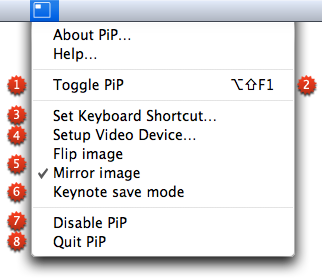 PiP v1.1 is still available for users with older Macs, running Mac OS X v10.4 or v10.5. Please note, that PiP v1.1 is officially retired, i.e. it is offered as-is, without support! 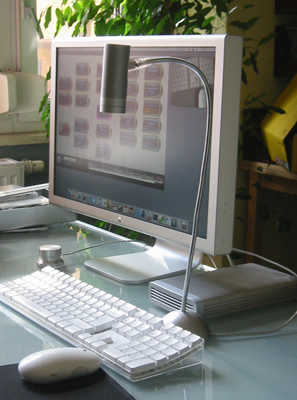 The most recent version of PiP 2 (for Mac OS X v10.6 and later) is available here. Change PiP's video device and its settings. By disabling PiP it will use virtually no CPU time. It's like PiP's taking a deep sleep without vanishing from the menubar. Quitting PiP frees all resources but also removes PiP's icon and menu from the menubar. 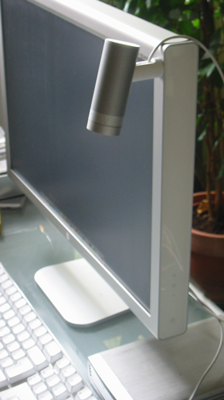 Fixed a problem with some web cams, causing PiP to display the video image too small. 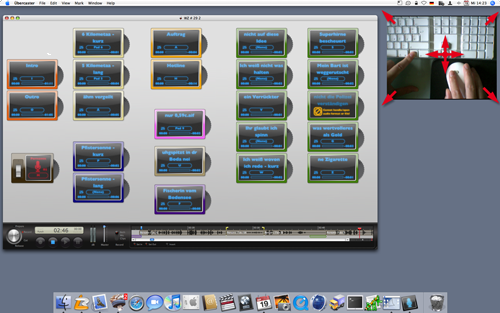 PiP can now work in a special mode, which enables it to be used during a Keynote presentation (see above list, no. 6). In addition to rotating by 180°, it's now also possible to mirror the image.